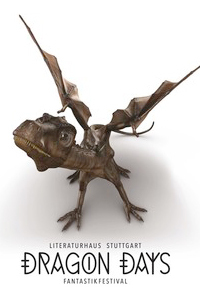 Following the success at the ITFS 2012, the "Lindwurm" trailer as well as its titular character were licensed by the Dragon Days fantasy festival in Suttgart, in order to become both the official trailer as well as the official prize statue. This included an online campaign plus a limited screening as a festival trailer in local cinemas, as well as some additional tie-in artwork and renderings of the Lindwurm with the possibility to expand for the upcoming festival date in the next year. In collaboration with the Löwentor Museum a presentation was held regarding the true origins of the "Lindwurm" and a technical breakdown of the trailer's work. For the statue a 3D model was preparated using the original assets, which was then printed out in wax, only to be encased in a cast which served as the actual mold for the final bronze cast of the scuplture. The prize was presented to the fantasy author Tad Williams during the festival. In part the festival was held at the Löwentor Natural History Museum in Stuttgart, the original shooting location of the trailer itself. The talks and presentations there were held right next to the original "Swabian dragons", of which the "Lindwurm" was actually inspired from.